Most travelers to Vietnam will take direct transportation from Hanoi to Hue, skipping over an extensive area of Northern Vietnam. In doing so, they’ll also pass over a little gem of a town only 150 kilometers north of Hue: Dong Hoi. Largely devastated during the Vietnam War, this lovely riverside town has made a comeback in recent years. Just across the river is Nha Le Beach. The long, idyllic sliver of sand is completely clear—clear of litter, clear of people, clear of hotels. It’s just beautiful smooth beach and a horizon to gaze out at. 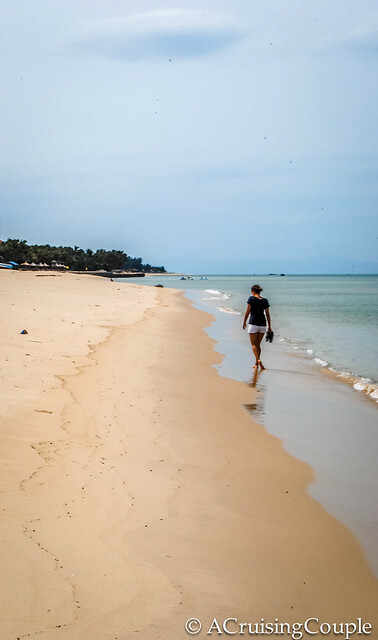 Nha Le Beach is about a 20-minute walk from Dong Hoi itself. Should you prefer to take the luxury route, there is a resort hidden on the left side of the beach. From our nosy wanderings across the resort grounds, it looks to be worth the splurge. 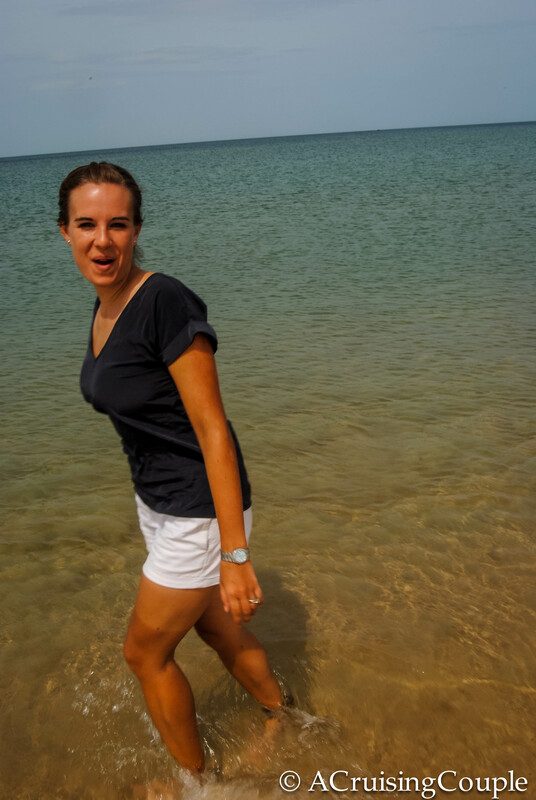 If you do find yourself enjoying the pristine beach, note that the current is said to be a bit strong. Okay. This isn’t particular to Dong Hoi, because basically everywhere we’ve stopped in Vietnam has had amazing food. We might actually be gaining weight despite the insane number of kilometers we’re cycling per day. That said, we particularly enjoyed the eating atmosphere in Dong Hoi. Dine on fresh seafood on one of the floating riverboats. Grab a plastic stool across from the bay to watch dusk settle in while savoring stir-fried clams topped with pineapple (divine!). 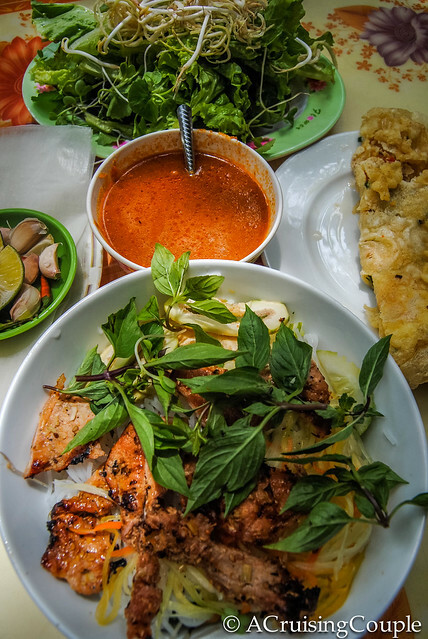 Sample Central Vietnam’s local specialties from vendors on a flower laden side street. You really can’t go wrong. Dong Hoi is starting to gain popularity for its close proximity to Paradise and Phong Nha Caves. For lack of time, we choose to enjoy the serenity of Dong Hoi itself, though we did seriously consider adding the caves to our cycling itinerary. Unfortunately we can’t say much else them from our personal experience, but we can direct you to the caves’ glowing reviews on Trip Advisor. Dong Hoi isn’t on the tourist track—yet. 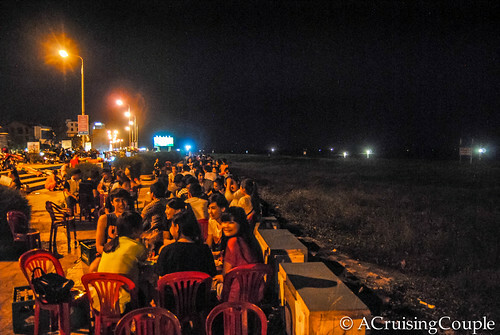 But with a great strip of beach and convenient location, it’s only a matter of time until more travelers decide to use Dong Hoi to break up their trip from Hanoi to Hue. We won’t be the judge as to whether that’s a good thing or not, but we will suggest that you check out Dong Hoi before everyone else does! Have you been to Dong Hoi before? Do you share secret gems with other travelers or keep these special places hush-hush? Any beach that’s clear of litter, people and hotels is a winner in my books! Looks amazing! Rika | Cubicle Throwdown recently posted…Hi from Canada, eh? Actually, one can see the oily waters of the harbour and the trash-strewn sands of the beach easily. Apparently, the photo was taken on a day when the beach was rubbish-free. 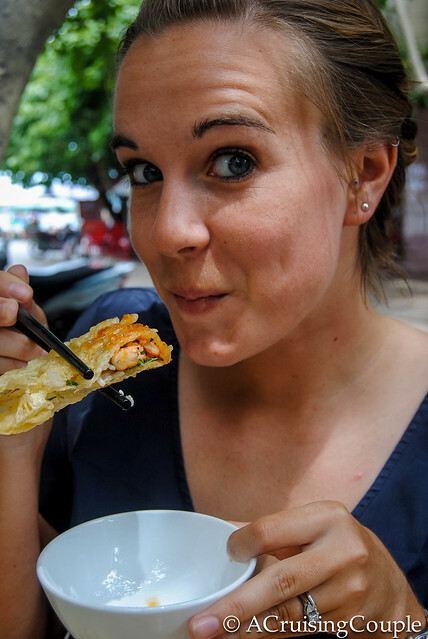 The South of Vietnam’s people and scenery and food are much, much better! In Dong Hoi, one pays 300,000 VND for a tiny imitation pizza, 100,000 VND for a “hamburger” that’s made of rancid mystery-meat, and 40,000 VND for “skunked” Bia Hanoi at the only so-called Western Cafe located across the street from the Communist Party-connected 5-star hotel (should be 3-star). Really, the city is something of a town, and is good only for 2 nights of rest. Wow, this looks like a gorgeous area to visit! Taking note for when we make it to Vietnam one day. It really is spectacular. We were shocked we had it all to ourselves. I hope you make it soon! It is a pretty awesome spot! We’ve only been to the top half so far (we’ll be cycling the south side over the next 3 weeks.) HCMC will be our last stop on the journey. I’m really hoping we have some extra time to get to the Mekong delta. Any suggestions on what we should see? Ooooh why couldn’t you have cycled through Vietnam BEFORE I went there so I could have followed your awesome tips for places to visit. I want whatever delishes herby goodness is on that plate! It’s grilled pork, noodles, fresh greens and rice paper. Essentially a super tasty DIY wrap. 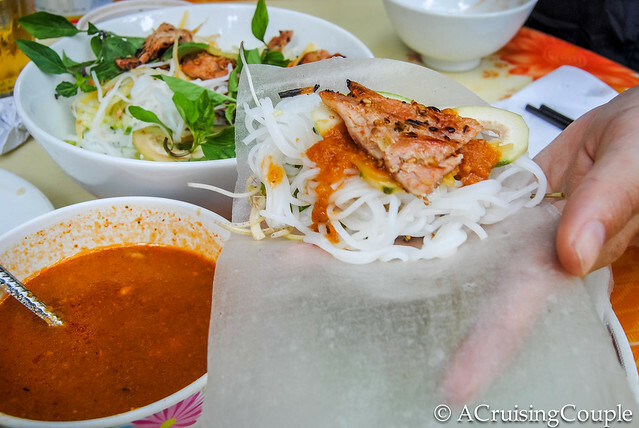 We can’t wait to do an extended post on all the delicious food in Vietnam! Seriously I don’t think there is one food we have tried here that I wouldn’t eat again. We aren’t very good with secrets anyway :-p and with a couple of resorts in the making I’m sure it won’t be a secret for much longer. Love this – thanks for the post. We are heading to Vietnam around September / October and wanted to find some unique places to stop in between major cities. This sounds great, and the caves too! So happy to hear that! Vietnam is really an amazing place, especially once you leave the main tourist hubs. Hope you enjoy your trip! This looks amazing! Can I ask what hotel you stayed in here? Heading there tomorrow, will let you know how the caves are! Stay away from Dong Hoi! There were soo many scams. A bowl of Pho that the rich locals paid 20,000 VND for cost me and my White European travel partners 75,000 VND. Attacks on German, Finnish, Dutch, Russian and American tourists occurred whilst I was there for the months of March and April, 2013 working for the World Health Organisation. I heard horror stories from foreigners teaching English at a place called Assemlink., which is on Vietnam’s National Highway Number One. A Nigerian, 2 Filipinos, a young Dutch-Israeli drug user and drunk named Daniel Gable, and an American guy who was badly done over by the school’s owner, each volunteered sad stories of being badly treated and not paid. I was there in that year as well, Roch, and can recall the Dutch guy telling me that there were quite a few Europeans and other Westerners who had Acid thrown on their faces, big Bia Hanoi bottles smashed over their skulls by randomly-passing males, and their phones and other valuables stolen from them at gunpoint. I stayed in perhaps the most famous family-operated mansion-hotel located directly across the street from the beach. The owner of Assemlink was good friends with the snake who owned the place, who was a local representative for the Communist Party at United Nations human rights conventions. Overall, the city of Dong Hoi was creepy and a rip off. Interesting… can’t say that anything like that happened to us while we were there, or that we heard any stories of similar incidents. Vietnam has more beautiful places. What about Phu Yen? It is a beautiful central province. 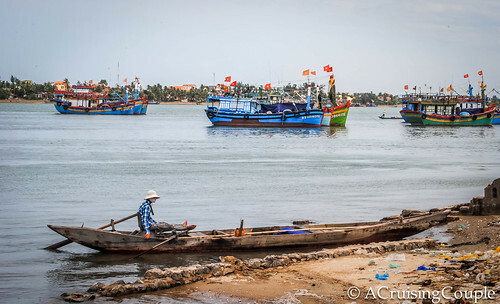 If you have a chance, visit to Phu Yen, the beach and the atmosphere here is so great.